I often enjoy reading independent and small-press comics, so when the person in charge of one, Zain Shenwari of, "InZane Comics," reached out to me about his comic he wrote, "The Elemental Balance," I told him I was happy to give it a read. Having now checked-out the first issue I can say I enjoyed it a great deal thanks to a mixture of fun ideas and a quick-moving plot. 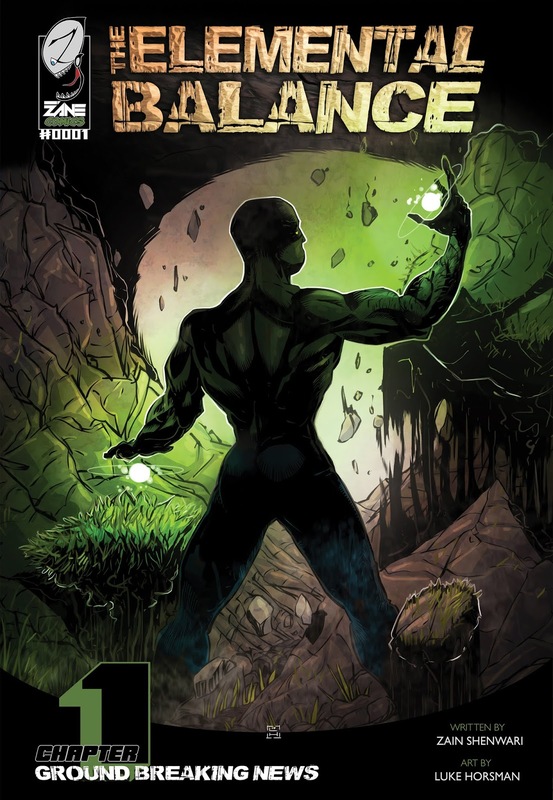 "The Elemental Balance," follows a woman named Chole who we learn later in the first issue is hiding a secret--she has water-based elemental powers. The opening of the comic lays-out a lot of the sci-fi potential for such a thing, and it sets-up the later reveal quite well. It is hinted that during a cruise Chole was on something happened that unlocked these abilities, but in the process a whole lot of folk died (which may very well be a catalyst). Chole ends-up having a dream of a terrible disaster in Kenya, then when the news reports it rushes there to find what turns out to be another person with powers, a man who now has the ability to reshape the Earth. The issue ends on a bit of a cliffhanger as Chole agrees to share just how she got her powers (which issue #2 will most likely further explain). A lot happens at a good pace in the book, with it never feeling annoyingly decompressed like some comics these days. Chole is a likeable character and when it is revealed later in the book she has water powers they are fun to see drawn by the artist on the comic, Luke Horsman. Horsman's style looks a little cartoony and sketchy, which works well for when all kinds of powers are being used. I also like how the book is a written in way where the characters have powers, but its not a super-hero book, things are presented almost more in a sci-fi and horror fashion, with these people scared about what they can do as opposed to wanting to put on tights and fight criminals. It is a good read and I hope to check out the other issues in the near future sometime too. Note: A digital copy of the comic was provided by the publisher for the purposes of review.